A cottage, villa or holiday rental with its own swimming pool is simply divine, especially when surrounded by stunning scenery. A pool provides that chance to swim, relax, sunbathe beside it, play games in the water with children and have an extra element of fun on holiday without going far. 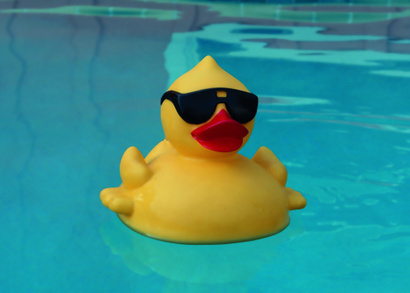 If your children are learning to swim, having access to a pool on holiday gives them lots of practice - they will improve their skills and techniques without realising it. Treat yourself to a holiday to remember for ever and book a villa with a pool. Click on the headings for cottages, villas and self-catering accommodation with swimming pools. Holiday accommodation with a swimming pool usually has changing rooms and a showers associated with it. 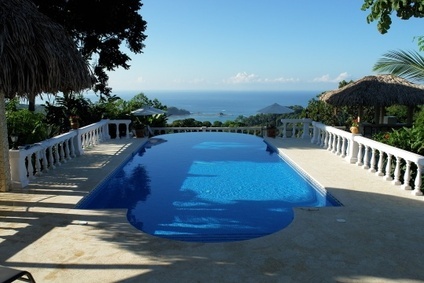 Where will you look for a villa with a pool? All kinds of alternative swim related variations are possible. The safest swimming pools for family use are those that are of a single depth and do not have a deep end. Sometimes there will be a jacuzzi incorporated into the swimming pool itself or it may a self-standing extra. We tend to associate the word 'villa' with houses abroad and often for holiday purposes, imagine them to have their own pristine blue swimming pool outside under a sunny blue sky. There are also villas which are usually just called self-catering cottages in the UK or holiday homes in Ireland. This page will lead you to find all kinds of villas, cottages and lodges in the UK and also abroad - all of which have either a pool with exclusive use or communal use in a holiday park.